Nazi Germany invaded France in 1940. In every occupied town, Nazi soldiers put up posters that demanded that civilians surrender their firearms within twenty-four hours or else be shot. Despite the consequences, many French citizens refused to comply with the order. 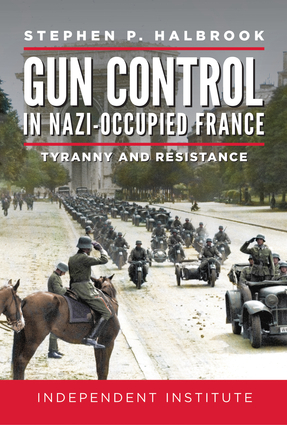 In Gun Control in Nazi-Occupied France: Tyranny and Resistance, Stephen P. Halbrook tells this story of Nazi repression and the brave French men and women who refused to surrender to it. Taking advantage of a prewar 1935 French gun registration law, the Nazis used registration records kept by the French police to easily locate gun owners to enforce their demand that firearms be surrendered. Countless French citizens faced firing squads for refusing to comply. But many French citizens had resisted the 1935 decree, preventing the Nazis from fully enforcing the confiscation order. Throughout the Nazi occupation, the French Resistance grew, arming itself to conduct resistance activities and fight back against the occupation. Drawing on records of the German occupation and testimonies from members of the French resistance, Gun Control in Nazi-Occupied France is the first book to focus on the Nazis' efforts to disarm the French. "Stephen Halbrook has done it again, broken new ground with meticulous historical 'gun control' research. This is the harrowing story of Nazi and Vichy government savage repression of French gun owners, in part made possible by pre-war French firearms registration. Gun Control in Nazi-Occupied France is an important and highly readable addition to scholarship on how dictators and invaders have disarmed conquered populations." —James B. Jacobs, Chief Justice Warren E. Burger Professor of Constitutional Law and the Courts; Director, Center for Research in Crime and Justice; New York University; author, Can Gun Control Work? Stephen P. Halbrook is a Senior Fellow at the Independent Institute. He has taught legal and political philosophy at George Mason University, Howard University, and Tuskegee Institute, and he received his J.D. from the Georgetown University Law Center and Ph.D. in social philosophy from Florida State University. The winner of three cases before the U.S. Supreme Court (Printz v. United States, United States v. Thompson/Center Arms Company, and Castillo v. United States), he has testified before the Subcommittee on the Constitution of the Senate Judiciary Committee, Senate Subcommittee on the Constitution, Subcommittee on Crime of the House Judiciary Committee, Senate Governmental Affairs Committee, and House Committee on the District of Columbia. A contributor to numerous scholarly volumes, he is the author of the books, Gun Control in the Third Reich: Disarming the Jews and "Enemies of the State"; The Founders' Second Amendment: Origins of the Right to Bear Arms; and That Every Man Be Armed: Evolution of a Constitutional Right; A Right to Bear Arms, among others.